Toronto – February 5, 2014 – This week marks the second anniversary of one of the deadliest highway collisions in Ontario history. On February 6, 2012, a 13-passenger van collided with a flatbed truck on a county road near Hampstead, Ontario. A trail of carnage was left near the accident site, as a single family home, painted sky blue, stood virtually untouched while the accident victims lay just a few metres away from the front door. Ten migrant workers perished that day, while three others barely survived to tell their story. As a community all too accustomed to responding to workplace death, we mobilized at a national level. Through the inception of the Migrant Workers Family Support Fund Support Fund, created by UFCW Canada and Agricultural Workers Alliance (AWA), approximately $225,000 was raised through the generosity of organizations, labour allies and individuals across Canada. In total, 14 individuals or family members of those who perished, received 100% of the funds collected, including the family of the flatbed truck driver who also perished in this accident. Juan Jose Ariza and Javier Aldo Medina were two of the survivors of the tragedy. They recuperated in a nursing home in London, Ontario following the accident, and with the help of advocacy groups and UFCW Canada, began a campaign entitled “Right 2 Stay”. Their hope was that they would be granted the right to remain in Canada on a permanent basis and bring their families at some point in the future. Both men’s situations took them back to Peru by 2013. With no precedent-setting cases before theirs, affording them some semblance of a future in Canada, despite their permanent disabilities they eventually returned to their home cities in Peru to secure and care for the reason they first migrated to Canada – their families. All the while, in February 2013, the Ontario government – pointing to “driver’s error” – denied UFCW’s call for a Coroner’s Inquest into the crash. So agricultural workers continue to be subject to unreasonable and life-threatening risks on the road, without even taking into consideration the health and safety risks on the job. “The Ontario government has a responsibility to act proactively in light of the Hampstead tragedy. Finger pointing and laying the blame on a driver of a 13-passenger van, who was a migrant worker himself, subjected to all of the fatigue that comes with training five new employees on their first day of work, is absurd," says Paul Meinema, National President of UFCW Canada. "We need to prevent such tragedies from happening in the first place. One loss of life is too many, especially when we have the means to investigate and introduce regulations regarding the safe transportation of agriculture workers”. Ensure that the employees are supplied with written documentation outlining their rights. In the wake of the Hampstead tragedy, family members continue to pick up the pieces of a family life that was all but shattered by the death and injury of their loved ones. While some are attempting to forge ahead in Peru – where most of the migrant workers came from – for others life remains a struggle to continue living day by day. Ian Forrest, Mayor of Perth East County, remains hopeful nonetheless. The accident has undoubtedly shaken up this community which remains forever changed as a result of this tragedy so close to home. “We have improved Emergency Measures Procedures following this accident. Particularly to the communications systems employed at the time of first response.” Glenn Schwendinger, CAO of Perth East County, maintains that there has been a permanent effect, particularly on First Responders to the horrific crash, and that tragedy continues to be talked about and remembered by residents who felt compelled to mobilize and come together to provide physical and emotional support to those in need following the crash. 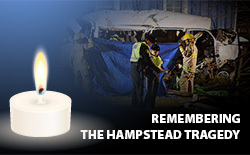 Yet, the impact of the Hampstead tragedy goes well beyond the local community. “We need to do more as a Canadian society, and we need to hold the Ontario government to account," says Brother Meinema. "The BC Coroner's inquest into the 2007 Abbotsford crash led to improved safety for migrant workers in British Columbia. Yet, shamefully and arbitrarily, Ontario dismissed such an inquest out of hand for Hampstead."